Sinclair Broadcast Group and Tribune should never be allowed to merge. If this deal goes through, a single company would own more than 200 local-TV stations reaching more than 70 percent of the country. That's far beyond the legal limits on media ownership and far too much power in the hands of a single company. Sinclair has evaded FCC rules, received FCC fines for airing propaganda, and drawn wide criticism for airing politically slanted content on its stations. The FCC should block this merger and restore policies that encourage a diversity of local media owners and a wide range of viewpoints. Trump’s FCC is paving the way for Sinclair Broadcast Group — already the nation’s largest TV conglomerate — to take over Tribune,1 which owns 42 stations in many of the country’s big cities, including New York, Los Angeles, Chicago, Philadelphia, Dallas and Denver. This deal would have been DOA in any other administration. It would create an unthinkable level of media consolidation by a company that’s used the public airwaves to push a conservative political agenda. But Trump’s FCC is actually rewriting the rules to make it happen2 — and to give one of the administration’s loudest media boosters an even bigger megaphone. Sinclair is notorious for slipping right-wing views and Republican talking points into its newscasts. The company overrides the objections of local journalists and forces its stations to run conservative commentaries and slanted stories on the local news. If this deal goes through, Sinclair’s cookie-cutter, Trump-boosting content could reach more than 70 percent of the U.S. population.5 That means more distorted commentary — and less of the local news people really need. 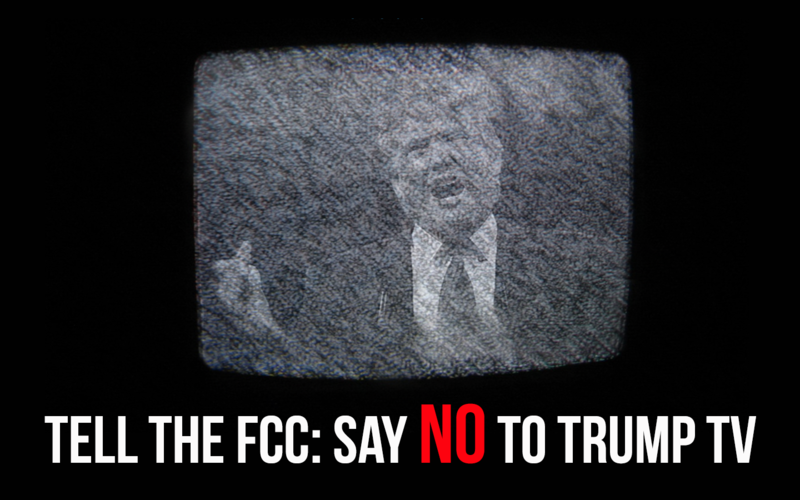 Stop the Sinclair merger and unplug Trump TV.